iDid: The Heads-up Feature : iDid Inc. I was driving to visit a friend and he lives just beyond this wannabe-downtown hip place with one-way streets for no real reason. I was not very familiar with the streets and it was almost getting dark. So I had a strong desire to not get lost. You will understand my sentiment better if you knew that the most often spoken line on my Nav is “Please make a U-turn, if possible“. So I was quite focused. Then he calls. I’m less than 5 minutes away and so I decide to not answer. Well, I really don’t want to get lost. Then I remember that this person is often a bit anxious, so now I am expecting another call! That’s when I thought to myself, this situation is perfect for the “heads-up” feature. 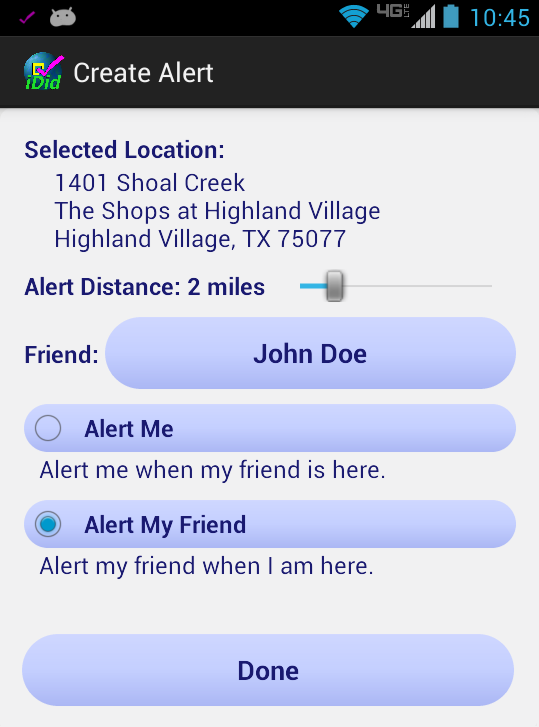 The app automatically texts the person that you will be there soon so you can focus on your driving. Often only closer to your destination things are unfamiliar and you are rushed. As you are trying to look at street addresses on buildings – that are hidden for some reason – you can certainly do without that incoming distracting call. iDid’s heads-up feature does exactly that. Gives them the information they want and preempts that call.